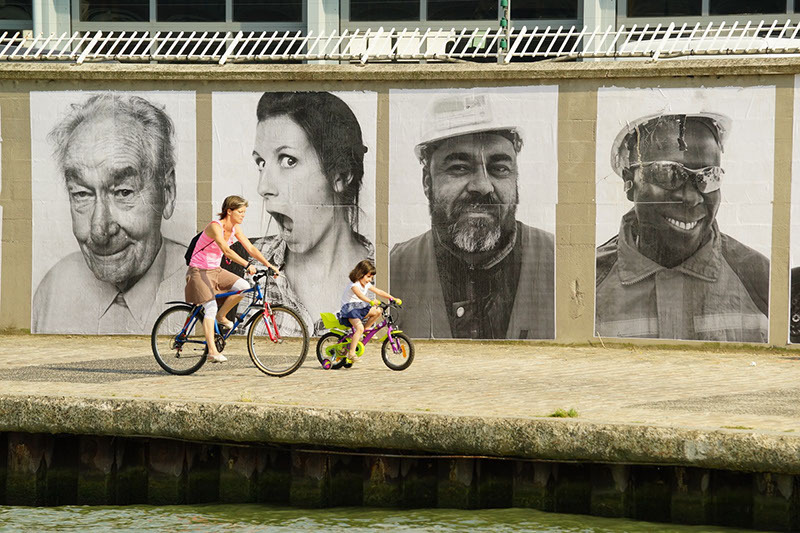 Ces visages en noir et blanc racontent l’évolution du Canal de l’Ourcq qui change de visage. Le visage est une politique. Fig. 1. L’Ourcq mon Amour, 2013. Photograph by Christophe Brachet, courtesy of Marie Morillion and the Inside Out Project, New York. This essay takes the strands of aesthetics, politics and affect to examine the interrelation between street art and urban renewal in re-making ‘place’ in the Paris banlieues. If recent French policies of decentralization and urban ‘renewal’ or ‘renovation’ present opportunities to rethink the affective terrains defining the banlieues’ relationship to the capital, they also present the need to resituate cultural production within the context of the territorial disturbance of suburban renewal. In this exploratory piece, I want to look at one aesthetic ‘refrain’ in particular – the human face in the ‘photograff’ (a photographic form of street art, a linguistic blend of ‘photograph’ and ‘graffiti’) – to suggest how the face in the urban environment invites an affective approach to considering the spatialities emergent at the edge of the intra muros city. 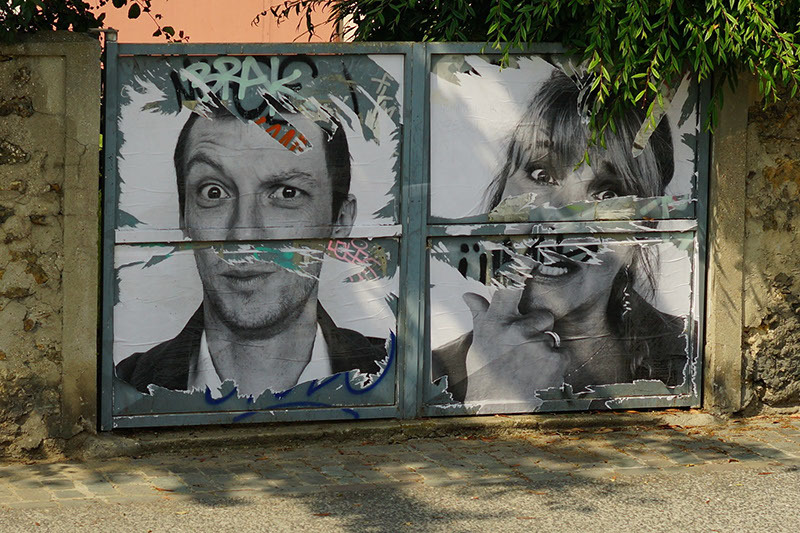 It is the affective interrelation between the human face in street art and spatialities of renewal in suburban Paris that is at the heart of this discussion, where spatiality is understood to mean the relatively grounded and constructed series of socionatural processes in which humans participate and which, mutually, shape what happens in space. 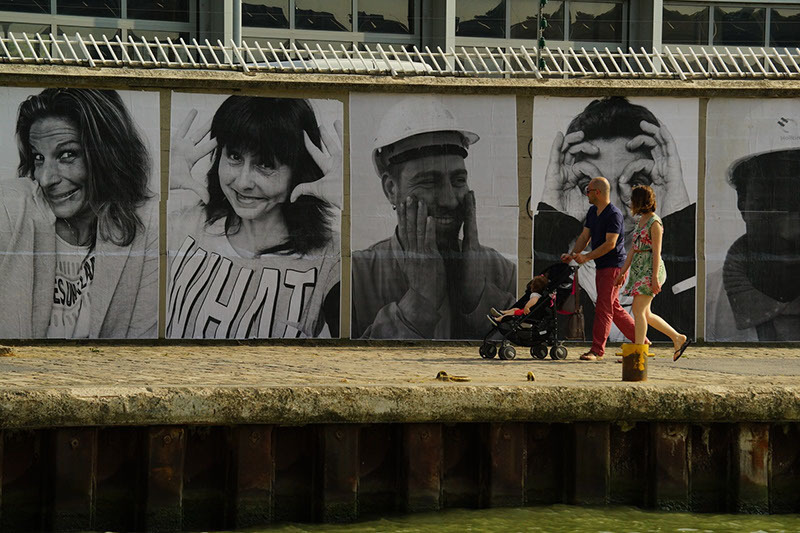 The affective relation that ensues from the encounter with the human face, postered and pasted onto the walls of a suburb undergoing renewal and within the greater context of the Inside Out project, brings into view a moving interaction of urban artefacts, histories and aesthetic sensibilities – what Gilles Deleuze and Félix Guattari will term ‘la ritournelle’, the refrain – which, while these may anchor the ‘virtual synesthetic perspectives’ that constitute affect, at the same time, open onto a myriad of potential encounters between people in public; or, better, they open onto a politics. Street art, as a flourishing aesthetic form engaged in the production of global urban spatialities, is a particularly suitable object through which to study the affective politics which the street photograph of the human face produces. By virtue of this art form’s haptic reliance on the grain of the urban environment (its material substratum) and for its exposure to the flitting temporalities of city life and urban bodies, it brings into view the ‘micropolitical events of everyday life’. Moreover, the transitory nature of art in the street, as well as its reliance on the material intensities of that street – from weather, to traffic, to human intervention, to architecture – invites contextually resonant explorations of the particular faces which are given to view in the suburbs, and the situatedness or, micro, ‘molecular’ tendencies of the objects and subjects involved. To put this another way, rather than asking what it is the face says or what it expresses, we are concerned here with what a face does, with how it reaches away from itself to enact an affective relationship with the time-space of its viewing. In what follows I read the politics of suburban renewal as a politics of the face, leaning on Deleuze and Guattari’s conceptual nexus of visagéité, or ‘faciality’, to explore the politico-aesethetic implications of renewal as an organization of sensible, embodied experience in the suburb of Pantin, a town on the eastern edge of intra muros Paris in the département of Seine-Saint-Denis. Surveying renewal as a procedure engaged in reworking the ‘face’ of the suburbs, the architectural renovation and cultural rehabilitation carried out by local government and state bodies in Pantin is read here as a suite of ‘facializing’ affects – where, in Deleuzian terms, the face, conceived as ‘la machine abstraite de visagéité’, characterizes systemic mechanisms of control. In the French context, the identity politics of the suburban face can be read in relation to Giorgio Agamben’s notion of ‘identity without the person’, wherein the photograph defines the person within a set of circumscribed traits that transubstantiate subject to object. I discuss Agamben’s ‘knowledge effect’ more concretely in relation to the contemporary body politics of French Republicanism and its concern with cultural cohesion and citoyenneté as social instrument. In a second movement, the essay explores the agonism at stake in art’s participation in renewing the suburban face. Specifically, it examines the spatial politics of faces in the context of a street art project, ‘L’Ourcq Mon Amour’, part of JR’s larger Inside Out project, which formed part of the 2013 summer cultural programme, ‘L’été du canal, festival de l’Ourcq’; an annual series of events managed by the Comité Départemental du Tourisme, Seine-Saint-Denis. I want to point to how the politics of street art is peculiarly tangled in the shifting affective intensities in which it enmeshes the viewer, a weave to be disentangled here in terms of the affective temporalities of ‘before and after the caption’, or before and after the face is grounded in the textual milieu of its contextual frame. Before turning to the more concrete dimensions of renewal and street art, it is worth engaging with Deleuze and Guattari’s faces to sketch the relations between the affective event’s beginning as ‘powerful indetermination’ (‘before the caption’), and what Guattari calls the ‘logic of affects’ set into motion by ‘refrains’ that fold this indistinct ‘molecular rupture’ in signification back into some sort of order, cycling back through the mobile range of ambiguities of an initial encounter to produce ‘existential Territories’. The authors’ transcendental empiricist concept of ‘faciality’ provides hints for experimentation with spatiality as a politics of aesthetic affect, wherein the ‘face’ becomes the threshold organizing material systems and distributing power relations. In this conceptualization, the face enables a process of over-coding and, moving through successive stages of deterritorialization and reterritorialization, enters the bind of ‘signifiance et subjectivation’, whereby the face is produced as a set of traits (‘mur blanc-trou noir’) instrumental in these power mechanisms. Additionally, this power mechanism transfers to the face a twinned concept of ‘paysage’, marshalled as its concomitant territorializing mode. The ‘visage-paysage’ set is mobilized here for how it permits an understanding of the ‘softer’ modalities of renewal; renewal’s affective, aesthetic registers that operate through the material objects of the portrait photograph and the re-faced suburban landscape. In this way, Deleuze and Guattari’s conceptual constellations open a way to understanding renewal in terms of an aesthetico-affective ‘topos-face’, a de-regulated flow of ideas, matter and actions through which the epistemologies and ontologies of urban bodies emerge. The key interest here is, however, not only how the face produces or reproduces a certain ‘Politics’ in the sense of some Lacanian Master Signifier. If the face is a politics, then, Deleuze and Guattari suggest, dismantling the face is also a politics. In the context of the face in the photograph we might argue, along with Jenny Edkins, that the faciality of the subjectifying regime is fundamentally disturbed. For Edkins, in the photographic portrait the peculiar relationship between presence and absence interrupts the transmission of any transparent notion of personhood between viewer and viewed. She asks whether the portrait photograph is not always to some extent ‘an exemplary instance of dismantling the face, rendering it precarious?’ But where Edkins deals with persons quite tangibly absent – the missing, the dead or those exposed to mortal danger – the faces discussed here are those absented from view in quite another way; as inhabitants of the ‘badlands of the Republic’. Walking along the Canal de l’Ourcq on a July evening, and more than usually prone to the effects of the hot sun and sticky Paris pavements, due to my pregnancy, this urban walker goes in search of relief in the air-conditioned auditoriums of the MK2 cinema at Bassin de la Villette. Before reaching my destination however I spot on the walls of the refurbished La Rotunde café a poster at odds with the gloss and polish of the cinema’s billboards. It is the face that smiles first. My eyes make contact with those of a woman photographed in black and white and pasted in a poster onto the walls of the trendy café. The poster is of an ordinary woman, smiling across from the café wall. And, then, she is not alone – already the conflation of face and person – there are other faces, other eyes and smiles. Others almost monumental and occupying an entire wall, ethnic others – White, Black, Asian –, male and female, fixed but not still, posed but not ‘posey’, certainly not composed; these are faces in animation. This walker sets off under the sun to follow the faces. The ordinary face in urban public space is normally a fleeting impression, as people move past us, we habitually avoid or do not happen upon eye contact, remaining in the comfortable ‘private-public’ anonymity which urban living affords. Here, however, we are drawn, indeed called upon, to stop and look, a stopping facilitated by the posters’ size, their serial arrangement, and their contrast with the smooth Rotunda walls, the iron structures of Parc de la Villette and the concrete blankness of overhead bridges. More than this, however, what makes these images so compelling seems to be the full-frontedness of the human face and its black-and-white disembodiment floating still in the flow of urban activity; it is the face-to-face encounter that stops walkers in their tracks. Jill Bennett has argued that ‘art works through the production of sensation or feeling – and importantly through a bodily response.’ Art activates sensation. In this scenario, it is less what art is about, and more what art does, what it can do. So, what can the face do? Fig. 2. L’Ourcq mon Amour, 2013. Photograph by Christophe Brachet, courtesy of Marie Morillion and the Inside Out Project, New York. The first affect is a returned smile, these faces make one smile; beaming, they invite reciprocation. Afterwards, they draw into awareness an emergent sense of curiosity, of half-formed questions: who are these people, why are these posters here, what are they doing? The face draws us in and out. In ebbs and flows, the face demands our attention, returns us to ourselves, and then wills us outwards again, for a second look. In this pre-discursive mode there is the imminent realization of inscrutability: I am not in any dominant position, gazing freely in knowledge and without riposte. Rather, it is I who am left lacking – in knowledge, in live reciprocation: there is the smile but, while it prompts response, it does not return to me with another inflection. Furthermore, the face in the photograph is larger than life. If there is a ‘dominant’ involved it might be here – in scale – in the face looking over and above me, but its accessibility refutes this dialectic too. I can tear, draw on, intervene in this face. Dismantle it. It is vulnerable and… smiling. There is nothing left for me to do but look elsewhere, look at what they look at perhaps? Drawn outwards again, these faces’ resonance is perhaps elsewhere, not with the immediate viewer necessarily, but with the publicness of their position, with their surroundings. Perhaps the face in the photograph deterritorializes the viewer’s position in the space where they find themselves. Smiling here. Pasted here. What is ‘here’, then? More concretely again, why this canal, and – as we follow the trail of faces, past Parc de la Villette, under the périphérique and into neighbouring Pantin – what is happening here? Fig. 3. L’Ourcq mon Amour, 2013. Photograph by Christophe Brachet, courtesy of Marie Morillion and the Inside Out Project, New York. 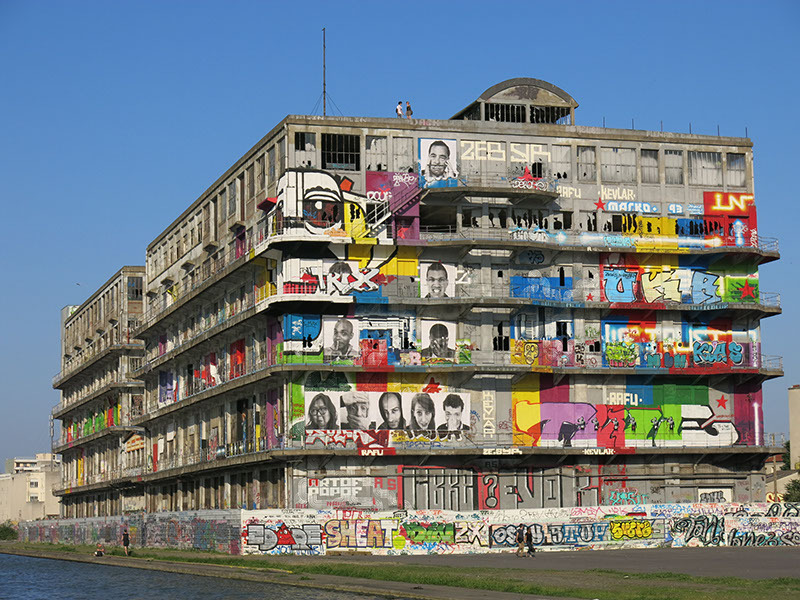 In this public space of the Canal de l’Ourcq, the refurbished buildings, Chanel headquarters, and new bank housed in the recently renovated former Grands Moulins de Pantin, stand adjacent with the industrial ruins that await restoration, graffiti-smothered walls and construction sites, bordered by placards announcing the imminent arrival of new apartment blocks. The faces end in a series posted onto the monumental ruined walls of the buildings of the former Chambre de Commerce et d’Industrie de Paris in the Pantin Basin. This ‘here’, then, is a space in transition, a space of ‘renewal’. So we might conclude that after ‘who’ there is ‘what’: the fact of the face. There is the face ‘before the caption’, before the setting into motion of the caption’s particular contextual rhythm of capture. We might rephrase this for Deleuze and Guattari as the emergence of the territory through the face as mark, as refrain. The faces here are removed from their ordinariness to a certain extent, or rather their ordinariness is made special by its re-presentation. The awareness of an artistic and sometimes amateur hand intervening in the urban space suggests an emergent force behind the wall. And in the moment ‘before the caption’ its intensities set into motion an alternative dynamics of the spatial and subjective codes that have been the defining socio-cultural chorus of the banlieue’s songlines. 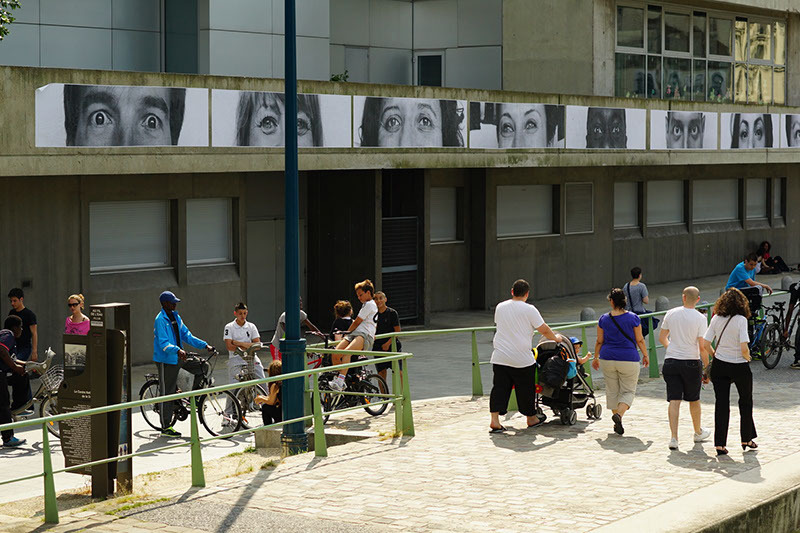 It is now that other ordinary faces, unseen, appear in the mind’s eye, the passing of each smiling face opening resonances elsewhere, the signs coming into view – ‘Seine-Saint-Denis’, ‘Pantin’ – and there is the hope that these black-and-white faces evoke a re-humanization of an area that has been so much dehumanized. A hope conditional upon this exhibition’s interruption of other demonizing, de-facing refrains – media refrains, governmental marks – of the banlieues as faceless, as ‘part without part’. And the barely formed question as I start the walk back home: does art help reconstitute the fabric of civic life? Fig. 4. L’Ourcq mon Amour, 2013. Photograph by Christophe Brachet, courtesy of Marie Morillion and the Inside Out Project, New York. In thinking about art in situ we are encouraged, then, towards a consideration of ‘the angle of our arrival’. Towards a way of seeing that acknowledges the multi-faceted and diversely constituted space-time of the city as it exists and has existed within our arena of perception, but more than this, towards a consideration of ourselves as viewers in a larger, mutually configured, urban assemblage. We are encouraged to view not only for ourselves, but also from outside ourselves, a position configured all the more by this exhibition’s deployment of the photographed person’s outward look. These faces – with their exposure to, empathy and haptic intimacy with the ephemeral flows of the city’s everyday life – help bring in view the messy lines between social reality and social code. They set into motion a spatiality of affect; perhaps even draw into tangible resonance for the viewer the ‘real fantasy’ of social life. At a fundamental level, urban renewal – whether cultural or architectural – is based on an understanding of the city as an emotional territory, wherein the creation of new spaces or the refurbishment of old ones aims at engaging the individual or group in a particular affective relationship with renewed surroundings. As Nigel Thrift sees it, ‘Increasingly, urban spaces and times are being designed to invoke affective response according to practical and theoretical knowledges that have been derived from and coded by a host of sources.’ The moment ‘before the caption’ thus emerges against a visuality that has been at work in the governmental and mediatized construction of the banlieues in terms of the Chiraquien imaginary of la fracture sociale and both the Left’s and Right’s understanding of the banlieues as zones apart, separate spaces designated by the emotionally evocative term zone sensible (with ‘sensitive’ operating on the valencies of ‘tender’, ‘sore’, as well as ‘volatile’ and ‘easily moved’) or, for urban renewal procedures, zones urbaines prioritaires (where ‘priority’ suggests urgency and the necessity of immediate attention). In place since the late 1990s and given legal status with the 2003 so-called ‘loi Borloo’, renewal can be located in the oppositional discursive mechanism within which the ‘unrenewed’ banlieue space is still largely understood. The last decade in particular has seen emerge a discourse of urban renewal which speaks to official needs to reclaim and reorder these spaces in response to the rise globally of the cultural economy, the adoption of a sustainability agenda and, on a national level, the necessity to maintain the identitarian coherence central to French Republicanism’s faciality of the citizen. Engaging critically with the emotive refrains of these territories, the affective capture of the banlieues as deviation can be seen as constituent in the renewal agenda and its careful re-designing of the suburban face. Furthermore, the capture of the banlieues as deviant terrain is manifest in a certain regime of corporeality designated as outside the bounds of the normative republican body. During the riots of 2005, in the photographs illustrating news reports both in France and abroad, burning cars and fire-lit streets seemed the inevitable backdrop to the mainstream portrayal of these incidents, the ‘rioting body’, often shown in silhouette, with facial features obscured or hooded or entirely invisible, being constructed as a spectacular, excessive body incarnating threat through its active, agitated state. However, hooded or masked, the deliberate dismantling of the face by the rioters themselves can be read as a mode that resists capture, expressive of a generalized fear of the ‘surveillance society’, but also perhaps of a certain resistance to the faciality imminent in the power apparatus of the neoliberal Republic and its dependence on ‘mass individuation, social differentiation, and intensified security’ for control. As much as the face of the citizen, therefore, the republican machine might be said to rely precisely upon the facelessness of its others, to require the threat of the non-face, so as to institute and validate the transparency apparatus underpinning its power structure. Within this weave of faciality traits that create the territory’s boundaries for inclusion and exclusion, the encounter with the face in the photograff is modulated by an attendant mnemonic refrain of facelessness. The hope imminent in encountering these smiling faces, however, suggests the territory’s openness, and art performs in this moment ‘before the caption’ as molecular interruption in the deviant-conformist binary of republican faciality. The diversity and ordinariness of the human face, the transparent slowness of a gaze returned in an urban environment, all combine to engage, to move, and perhaps even to provide relief – at the possibility of alterity – for the viewer. Why does this happen? Perhaps it is because of the seeming movement towards an affective relation between real bodies (that is, people facing one another, banlieusards, members of the public in Paris) that gives rise to what Guattari calls an ‘ethico-aesthetic’ paradigm that is also ‘ethico-political’, which is to say a paradigm that paves the way for ‘acceptance of the other, the acceptance of subjective pluralism.’ A relational and relatable humanity hints at its emergence as the face in the photograph performs contrapuntally with the refrains of the hood, the aggressive body, the burnt-out car, so that the faces along the canal suggest an inflection where we might begin to think ‘transversally’ about personhood in the banlieues, ‘opening onto value systems… with their social and cultural implications’. Permitting a crossing between the resounding intervals of ‘incidents’ and ‘racailles’ (rabble), these faces perform a smile of possibilities, of other ways of thinking and being in the banlieues. Fig. 5. L’Ourcq mon Amour, 2013. Photograph by Christophe Brachet, courtesy of Marie Morillion and the Inside Out Project, New York. Ecoute-moi, je sais encore, ça recommencera. […] L’asphalte brûlera. Un désordre profond règnera. Une ville entière sera soulevée de terre et retombera en cendres. The burning city smouldering in the background, in imminence, just as this exhibition suggests its portrayal of ‘l’évolution du canal de l’Ourcq qui change de visage’. It is the changing face of place and the relationship of the human face to processes of renewal to which I now turn. Fig. 6. L’Ourcq mon Amour, 2013. Photograph by Christophe Brachet, courtesy of Marie Morillion and the Inside Out Project, New York. ‘After the caption’ the face in the street is inserted into further layers of composition, then, that bring into play a series of what Guattari calls ‘complex refrains’ wherein media orchestrate a non-determinative set of resonances between marks. In this accumulation of affective refrains, the face is inserted once more into the republican faciality regime: as stakeholder in the cultural, architectural and economic renewal of the canal. And with this move begins an inexorable extension of intensities that fold back into governmental renewal policy’s engagement in a politics of spatial affect, designed explicitly with a view to ‘re-facing’ the suburbs and reterritorializing the Republic’s ‘badlands’. We are returned once more to the mind’s eye image of the faces that are not here – the faces who do not work, cannot work; the homeless, the disenfranchised, those identities defined by their lack of conformity with legislative requirements, the ‘sans papiers’, the faces of women who wear a burqa – the faces present along the canal are not the faces of the faceless, this is not fully the alternative, more human, face of the banlieusard as initially hoped. After the caption, the faces vacillate and are made to chime with the faciality regime of republican neoliberalism. In this regime, the face (with ‘work’ as its limit) comes to define the borders of exclusion in operation in processes of suburban renewal – the face is not something with which everyone is possessed, that everyone deserves. In the faciality regime, the face is not natural. Rather it constitutes a constrained, but comforting, terrain that proliferates the normative logic of the power structure. Fig. 7. L’Ourcq mon Amour, 2013. Photograph by Christophe Brachet, courtesy of Marie Morillion and the Inside Out Project, New York. Cette machine est dite de visagéité parce qu’elle est production sociale de visage, parce qu’elle opère une visagéification de tout le corps, de ses entours et de ses objets, une paysagéification de tous les mondes et milieux. […] Jamais le visage ne suppose un signifiant ou un sujet préalables. It is not a question here of politics producing faces, but of the face producing politics, affectively distributing the relation of the abstract machine to its subjects. 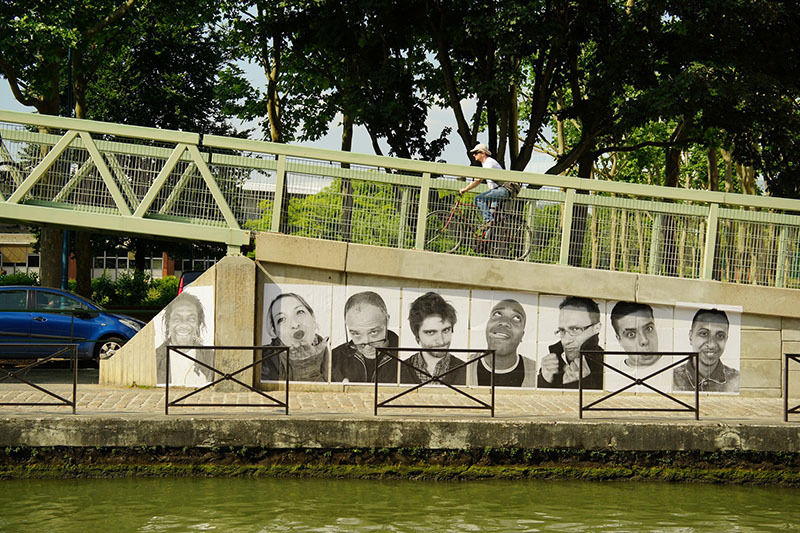 In this scenario, the faces along the canal reinforce the exclusion of a prevalent section of the ‘popular’ community resident in the banlieues. After the caption, then, we are dealing with a multiple affective interpretive space that confronts the viewer not with the politics of the face, but with a simultaneous political nexus from which a multiplicity of affective relations is produced. Fig. 8. L’Ourcq mon Amour, 2013. Photograph by Christophe Brachet, courtesy of Marie Morillion and the Inside Out Project, New York. The entanglement of affect and aesthetics draws us away from essences towards the messier question of our manner of approach, so that the question becomes, ‘not what something is, but how it is – or, more precisely, how it affects, and how it is affected by, other things’; beyond the delimitations of its being towards the possibilities of itself as act. The various refrains – smiling face, hooded face, working face – do not cancel each other out, but rather modulate in accordance with the different political intensities that seek to capture their meaning. Le gouvernement a lancé son plan Marshall. Il a fallu désenclaver les quartiers, casser les barres d’immeubles qui isolaient les gens du reste de la ville, dynamiter et reconstruire 200 000 logements, bâtir 300 écoles, tracer de grandes avenues… Aujourd’hui, les gens vivent mieux et le plus important dans tout cela c’est qu’ils ont réintégré la République. Fig. 9. L’Ourcq mon Amour, 2013. Photograph by Christophe Brachet, courtesy of Marie Morillion and the Inside Out Project, New York. The practices of the Borloo policy and the cultural programmes at work in the banlieues rely heavily, then, on the visibility of new refrains. The primacy of architecture’s spatial register, its ability to reconfigure the visible and integrate disparate parts of the city, makes it a prominent metaphor for the governmentality of Republicanism. Mapping spatial coherence onto social cohesiveness preserves the republican emphasis on social solidarity, and discloses a sensible distribution wherein landscape assumes a pedagogical efficacy; if we build coherence, the commons (our shared socio-political space) will be coherent. Fig. 10. L’Ourcq mon Amour, 2013. Photograph by Christophe Brachet, courtesy of Marie Morillion and the Inside Out Project, New York. This interruptive moment is particularly powerful in the case of street art, which in a very material way makes itself vulnerable to the urban environment. As an emergent form of public art it is constituent with the space of democracy and thus implicated in issues of the ‘right to the city’, in questions surrounding the precise nature of the ‘public’, and in concerns about identity and voice, belonging and non-belonging that are always at stake in public space. 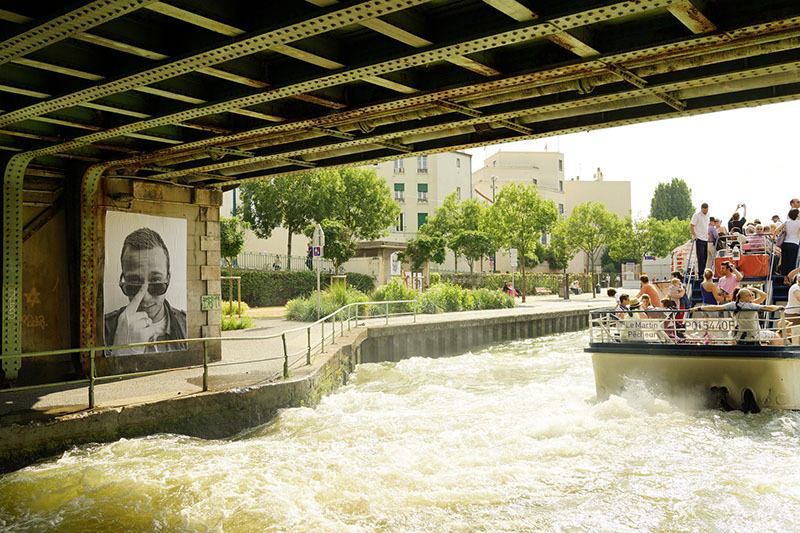 After a few days on display, the faces along the Canal de L’Ourcq began to show evidence of their exposure to the outdoors and, more importantly, to the interventions of other, unknown viewers. 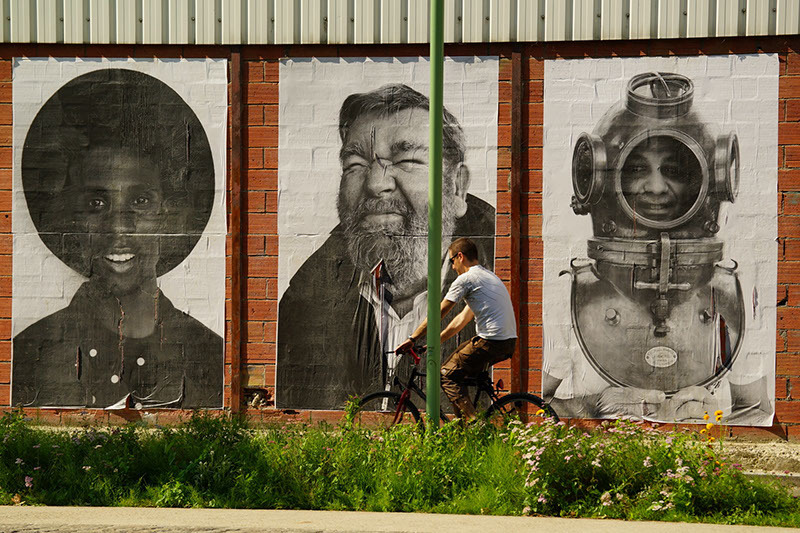 In the first instance, ‘unofficial’ participants posted self-made portraits alongside those ‘official’ posters printed in New York by JR’s Inside Out project. But where some participated to make, others intervened to unmake, and the final refrain to emerge from these faces is, perhaps, that of the tear; a number of these faces were torn by the unseen hands of other members of the public. What is it that interpolates a person to tear at the face in the photograph in the street? Does this tearing suggest a more latent interruption in the sensible? Is it a refusal to be excluded from the meaning of public life or a rejection of the political and cultural processes currently underway here, or both at once? If the face moves us to action, then looking cannot be the only act it might configure, and we might consider the face as a calling to gesture. And, if the face is inserted in the faciality regime coordinating the limits of exclusion in the social body, might not the tear be understood as the dissensual tearing away at that regime, with the banlieues as its locus of enunciation? Does the tear suggest the immanence of ‘being-capable’? Fig. 11. L’Ourcq mon Amour, 2013. Photograph by Christophe Brachet, courtesy of Marie Morillion and the Inside Out Project, New York. I began this essay with an analysis of the face as a refrain in the case of street art in the Paris banlieues. This allowed for an understanding of the affective terrains that art enables, bringing into view the soft ‘hope’ that renewal processes seem to suggest in the moment ‘before the caption’, and permitting a critical appraisal in the moment ‘after the caption’ of processes of exclusion still at work in the faciality regime of republican neoliberalism. However, paying attention to art on the street as a processual series of affective relations has a certain power beyond conclusion, and even beyond critique. It suggests also the uncertain, ongoing mutability of personhood in the French Republic and the possibility ‘to envision different formulas organizing social life.’ Behind the smiling face, and outside of national politics, there is an ethical encounter at stake: the encounter with the unemployed, the veiled, and the disenfranchised. The ethics of this encounter is premised on the extent to which the uncertainty or, better, the possibility for alternatives, which ‘the everyday infinity of affective powers’ suggests can be accepted. A space, then, where the neoliberal conservatism that too often grounds refrains of public life in discursive mechanisms of universalism is uprooted, torn at, and new ways of being together in public might emerge. Agamben, Giorgio. ‘Identity without the Person.’ In Nudities, translated by David Kishik and Stefan Pedatella. Stanford, CA: Stanford University Press, 2011: 46–54. ———. The Open. Man and Animal. Stanford, CA: Stanford University Press, 2004. Ahmed, Sara. ‘Happy Objects.’ In The Affect Theory Reader, edited by Melissa Gregg and Gregory J. Seigworth. Durham, NC: Duke University Press, 2010: 29–51. Baran, Claudie. ‘‘Je veux qu’on aille plus loin’.’ Le Figaro. April 18, 2012. Accessed July 15, 2014. http://www.lefigaro.fr/lefigaromagazine/2012/03/23/01006-20120323ARTFIG00720-je-veux-qu-on-aille-plus-loin.php. ———. ‘Rénovation urbaine: quels résultats?’ Le Figaro. April 4, 2012. Accessed April 20, 2014. http://www.lefigaro.fr/immobilier/2012/03/23/05002-20120323ARTFIG00708-renovation-urbaine-quels-resultats.php. Bennett, Jill. Empathic Vision: Affect, Trauma and Contemporary Art. Stanford, CA: Stanford University Press, 2005. Bertelsen, Lone and Andrew Murphie. ‘An Ethics of Everyday Infinities and Powers: Félix Guattari on Affect and the Refrain.’ In The Affect Theory Reader, edited by Melissa Gregg and Gregory J. Seigworth. Durham, N.C.: Duke University Press, 2010:138–157. Braidotti, Rosi. Transpositions: On Nomadic Ethics. Cambridge: Polity, 2006. Dauncey, Hugh and Geoff Hare, eds. France and the 1998 World Cup: The National Impact of a World Sporting Event. London: Routledge, 1999. Davidson, Mark. ‘Gentrification as Global Habitat: A Process of Class Formation or Corporate Creation?’ Transactions of the Institute of British Geographers 35, no. 4 (2007): 490–506. Deleuze, Gilles and Félix Guattari. Mille Plateaux: Capitalisme et Schizophrénie 2. Paris: Editions de Minuit, 1980. Deleuze, Gilles. ‘Post-scriptum sur les sociétés de contrôle.’ In Pourparlers. Paris: Minuit, 1990: 229–247. Derrida, Jacques. Spectres de Marx: L’Etat de la dette, le travail du deuil et la nouvelle Internationale. Paris: Galilée, 2006. Deutsche, Rosalyn. Evictions: Art and Spatial Politics. London and Cambridge, Mass: The MIT Press, 1996. Dikeç, Mustafa. Badlands of the Republic: Space, Politics and Urban Policy. London: Blackwell, 2007. ———. ‘Immigrants, Banlieues, and Dangerous Things: Ideology as an Aesthetic Affair.’ Antipodes 45, no.1 (2013): 23–42. Duras, Marguerite. Hiroshima, Mon Amour. Paris: Gallimard, 1972. Edkins, Jenny. Face Politics. London: Routledge, 2015. Epstein, Roger. ‘Rénovation urbaine: Succès politique d’une politique en échec.’ L’Observatoir Régional de l’Intégration et de la Ville (June 7, 2012): 5. Accessed November 10, 2013. http://www.oriv-alsace.org/pages1/6-poli/thematiques/rencontre_oriv_synthese_intervention_r_epstein_juin_2012.pdf. Foucault, Michel. Surveiller et Punir. Paris: Gallimard, 1975. Gates, Kelly. Our Biometric Future: Facial Recognition Technology and the Culture of Surveillance. New York: New York University Press, 2011. Goffman, Erving. The Presentation of Self in Everyday Life. London: Penguin 1990. First published 1959 by Anchor Books. Guattari, Félix. Chaosmosis: An Ethico-Aesthetic Paradigm, translated by Paul Bains and Julian Pefanis. Sydney: Power, 1995. ———. Chaosophy. New York: Semiotext(e), 1995. ———. The Guattari Reader, edited by Gary Genosko. London: Blackwell, 1996. Hugues, Bastien. ‘D’Argenteuil à Bobigny, les visites de Sarkozy en banlieue.’ Le Figaro. November 24, 2009. Accessed July 23, 2013. http://www.lefigaro.fr/politique/2009/11/24/01002-20091124ARTFIG00435-d-argenteuil-a-bobigny-les-visites-de-sarkozy-en-banlieue-.php. ‘Inside Out – L’Ourcq mon amour,’ Inside Out Project, last modified July 7, 2013, http://www.insideoutproject.net/fr/group-actions/france-cedex. Jacobs, Jane. The Life and Death of the Great American Cities. London: Vintage, 1992. First published in 1961. Jein, Gillian. ‘(De)Facing the Wall: The Traditions, Transactions and Transgressions of Street Art.’ Irish Journal of French Studies 12 (2012): 83–111. Kiwan, Nadia. ‘The Citizen and the Subject.’ In Redefining the French Republic, edited by Alistair Cole and Gino Raymond. Manchester: Manchester University Press, 2006: 97–116. Lacan, Jacques. ‘The Split between the Eye and the Gaze.’ In The Four Fundamental Concepts of Psychoanalysis, translated by Alan Sheridan. New York: Norton, 1978: 67–78. ———. Le Seminaire. Livre 17, l’envers de la psychanalyse. Paris: Seuil, 1991. Lefebvre, Henri. Le Droit à la ville. Paris: Anthropos, 1968. Meizer, Sara E. and Kathryn Norberg, eds. From the Royal to the Republican Body: Incorporating the Political in Seventeenth- and Eighteenth-Century France. Oxford: University of California Press, 1998. Miles, Malcolm. ‘Interruptions: Testing the Rhetoric of Culturally led Urban Development.’ Urban Studies 42, no. 5/6 (2005): 889–911. Miles, Steven and Ronan Paddison. ‘Introduction: The Rise and Rise of Culture-led Urban Regeneration.’ Urban Studies 42, no. 5/6 (2005): 833–839. Moran, Matthew. ‘Opposing Exclusion: The Political Significance of the Riots in French Suburbs (2005–2007).’ Modern and Contemporary France 19, no. 3 (2011): 297–312. Rancière, Jacques. La Mésentente: Politique et Philosophie. Paris: Galilée, 1995. Rushton, Richard. ‘What Can a Face Do? : On Deleuze and Faces.’ Cultural Critique 51 (2002): 219–237. Seigworth, Gregory J. and Melissa Gregg. ‘An Inventory of Shimmers.’ In The Affect Theory Reader, edited by Gregory J. Seigworth and Melissa Gregg. Durham, NC: Duke University Press, 2011: 1–25. Shaviro, Steven. ‘Pulses of Emotion. Whitehead’s ‘Critique of Pure Feeling.’ The Pinocchio Theory. Last modified 2007. Accessed May 5, 2013. http://www.shaviro.com/Othertexts/Pulse.pdf. Sheikh, Simon. ‘In the Place of the Public Sphere? Or, The World in Fragments.’ In Situation: Documents of Contemporary Art, edited by Claire Doherty. London and Cambridge, Mass: Whitechapel Press and The MIT Press, 2009: 137–141. Simmel, Georg. ‘The Metropolis and Mental Life.’ In Classic Essays on the Culture of Cities, edited by Richard Sennett. Englewood Cliffs, NJ: Prentice Hall, 1969: 47­–60. First published 1903. Soja, Edward. ‘The Socio-Spatial Dialectic.’ Annals of the Association of American Geographers 70, no. 2 (1980): 207–225. Sontag, Susan. Regarding the Pain of Others. London: Hamish Hamilton, 2003. ‘Street art et graffitis, la Seine-Saint-Denis territoire d’invention et de création de l’art urbain.’ Seine-Saint-Denis Tourisme. Accessed July 17, 2014. http://www.tourisme93.com/street-art-graffitis-93.html. Thrift, Nigel. ‘Intensities of Feeling: Towards a Spatial Politics of Affect.’ Geografiska Annaler. Series B, Human Geography 86, no. 1 (2004): 57–78. Žižek, Slavoj. Tarrying with the Negative: Kant, Hegel and the Critique of Ideology. Durham, NC: Duke University Press, 1993. ‘300 photos noir et blanc exposées le long du canal de l’Ourcq.’ L’Express. July 9, 2013. Accessed October 12, 2013. http://www.lexpress.fr/actualites/1/culture/300-photos-noir-et-blanc-exposees-le-long-du-canal-de-l-ourcq_1265100.html. The primary research for this essay was kindly funded by the British Academy and by the Modern Humanities Research Association. I adapt the term ‘politics of spatial affect’ from Nigel Thrift. See Nigel Thrift, ‘Intensities of Feeling: Towards a Spatial Politics of Affect,’ Geografiska Annaler. Series B, Human Geography 86, no. 1 (2004): 57–78. ‘Inside Out – L’Ourcq mon amour,’ Inside Out Project, last modified July 7, 2013, accessed July 12, 2013, http://www.insideoutproject.net/fr/group-actions/france-cedex. 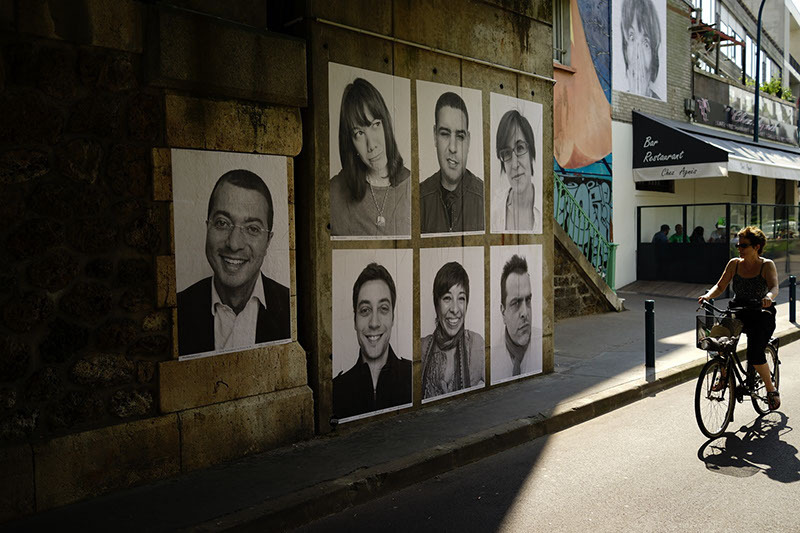 The Inside Out project was initiated by the Parisian street artist JR in 2011 as a globalized continuation of his work on bringing anonymous faces into public view. This work began with an ‘illegal’ exhibition in Les Bosquets, Montfermeil, Seine-Saint-Denis in 2004. See Gillian Jein, ‘(De)facing the Wall: The Traditions, Transactions and Transgressions of French Street Art,’ The Irish Journal of French Studies, 12, no. 1 (2012): 83 – 111. Gilles Deleuze and Félix Guattari, Mille Plateaux: Capitalisme et Schizophrénie 2 (Paris: Editions de Minuit, 1980). Images courtesy of Marie Morillion with thanks to Louise Prévot. The former term being preferred by the Left, with the latter designating much the same policies on the Right. Deleuze and Guattari, Mille Plateaux, 381–433. In this understanding, spatialities are constructed and produce sensory registers in multiple ways: materially, discursively and in the representations that are mobilized around certain ideas of space; through the performance of space, and crucially through the everyday mobilization of space in social, individual and institutional practices. Edward Soja frames this idea with the term ‘socio-spatial dialectic’. See Edward Soja, ‘The Socio-Spatial Dialectic,’ Annals of the Association of American Geographers 70, no. 2 (1980): 207–225. See also note 3, on the Inside Out project. Lone Bertelsen and Andrew Murphie, ‘An Ethics of Everyday Infinities and Powers: Félix Guattari on Affect and the Refrain,’ in The Affect Theory Reader, ed. Melissa Gregg and Gregory J. Seigworth (Durham, N.C.: Duke University Press, 2010), 138. For a discussion that moves from the face as sign to the face as act in Deleuze’s work see Richard Rushton, ‘What Can a Face Do? : On Deleuze and Faces,’ Cultural Critique 51(2002): 219–237. Deleuze and Guattari, Mille Plateaux, 205–234. Deleuze and Guattari, Mille Plateaux, 222. Giorgio Agamben, ‘Identity without the Person,’ in Nudities, trans. David Kishik and Stefan Pedatella (Stanford, CA: Stanford University Press, 2011), 46–54. For a historical reading of French Republicanism’s construction of the citizen and current issues challenging the Republic’s self-determination as ‘une et indivisible’, see Nadia Kiwan, ‘The Citizen and the Subject,’ in Redefining the French Republic, ed. Alistair Cole and Gino Raymond (Manchester: Manchester University Press, 2006), 97–116. Created in 1998, in tandem with Seine-Saint-Denis’s first step in cultural tourism in hosting the 1998 World Cup at the newly erected Stade de France, this is a central body for the organization of events, exhibitions and festivals that can be seen to work culturally in correspondence with the government-directed renewal initiatives concerning housing and architectural renovation. For the significance of the Stade de France in the symbolic ‘renewal’ of French identities, see Hugh Dauncey and Geoff Hare, eds, France and the 1998 World Cup: The National Impact of a World Sporting Event (London: Routledge, 1999). See also note 3, on the Inside Out project. The recent admission of street art into the white cube has been well-documented, and many of the artists working in the Pantin area are members of two visibility regimes – the public-space forum and the institutionally-coded regime of the gallery. The commodification of street art infers that assumptions as regards any innate potential of its ‘outsider’ status to disrupt dominant codes of visibility are no longer entirely tenable. See Gillian Jein, ‘(De)Facing the Wall: The Traditions, Transactions and Transgressions of Street Art,’ Irish Journal of French Studies 12 (2012): 83–111. Félix Guattari, Chaosmosis: An Ethico-Aesthetic Paradigm, trans. Paul Bains and Julian Pefanis (Sydney: Power, 1995): 15, 19. Deleuze and Guattari, Mille Plateaux, 214–215. Deleuze and Guattari, Mille Plateaux, 214. Thus pointing to a politics operating through a modality of ‘control’ rather than a more Foucauldian ‘discipline’ For example, in Foucault’s conceptualization, disciplinary societies erect spaces to produce subjects through power relations that might aim at the body’s confinement in specific spaces, or its reduction to social roles. However, with the mobilization of capital and, concomitantly, of bodies it becomes increasingly difficult for this model to hold. See Michel Foucault, Surveiller et Punir (Paris: Gallimard, 1975). Neoliberal and capitalist modes of social life are, then, more suited to a Deleuzian reading of the body as ‘dividualized’. See Gilles Deleuze, ‘Post-scriptum sur les sociétés de contrôle,’ in Pourparlers (Paris: Minuit, 1990), 229–247. In Lacanian theory the Master Signifier is one that stops the slippage of the signified. Fixing meaning, it ostensibly forms a stable symbolic order. See Jacques Lacan, Le Seminaire. Livre 17, l’envers de la psychanalyse (Paris: Seuil [1969–1970] 1991). Jenny Edkins, Face Politics (London: Routledge, 2015), 6. I borrow the term from Mustafa Dikeç, Badlands of the Republic: Space, Politics and Urban Policy (London: Blackwell, 2007). See Rosi Braidotti, Transpositions: On Nomadic Ethics (Cambridge: Polity, 2006). As against Susan Sontag, for example, who asserts that the political relationship with the photograph is only established after we have such context at our disposal because, she argues, the photograph itself is neutral. Susan Sontag, Regarding the Pain of Others (London: Hamish Hamilton, 2003), 55. Indeed, for Edkins, ‘photographs have a political impact because of the sort of object they are: they are, precisely, objects that resist an easy narrativisation.’ Edkins, Face Politics, 39. Bertelsen and Murphie, ‘An Ethics of Everyday Infinities and Powers,’ 148. Félix Guattari, The Guattari Reader, ed. Gary Genosko (London: Blackwell, 1996), 216. Bertelsen and Murphie, ‘An Ethics of Everyday Infinities and Powers,’ 139. See, for instance, Erving Goffman, The Presentation of Self in Everyday Life (London: Penguin  1990) and Georg Simmel, ‘The Metropolis and Mental Life,’ in Classic Essays on the Culture of Cities, ed. Richard Sennett (Englewood Cliffs, NJ: Prentice Hall, 1969), 47­–60. Jane Jacobs, The Life and Death of the Great American Cities (London: Vintage  1992). See John Urry, Mobilities (Cambridge: Polity Press, 2007). Jill Bennett, Empathic Vision: Affect, Trauma and Contemporary Art (Stanford, CA: Stanford University Press, 2005), 166. See Jacques Lacan, ‘The Split between the Eye and the Gaze,’ in The Four Fundamental Concepts of Psychoanalysis, trans. Alan Sheridan (New York: Norton, 1978), 67–78. See Jacques Rancière, La Mésentente: Politique et Philosophie (Paris: Galilée, 1995). Sara Ahmed, ‘Happy Objects,’ in The Affect Theory Reader, ed. Melissa Gregg and Gregory J. Seigworth (Durham, NC: Duke University Press, 2010), 37. Simon Sheikh, ‘In the Place of the Public Sphere? Or, The World in Fragments,’ in Situation: Documents of Contemporary Art, ed. Claire Doherty (London and Cambridge, Mass: Whitechapel Press and The MIT Press, 2009), 139. A Žižekian reading would point out that what we determine as social reality is a fantasy, a reality constructed through language and the symbolic. See Slavoj Žižek, Tarrying with the Negative: Kant, Hegel and the Critique of Ideology (Durham, NC: Duke University Press, 1993). Besides which, public space is, of course, never solely devoted to the contemplation of art. As the voluble petri dish of everyday life, public space is an inherently politico-aesthetic sphere where, through a nexus of restrictions and possibilities, the shape of spatialities is determined. Amongst the extensive literature, see for example, Mark Davidson, ‘Gentrification as Global Habitat: A Process of Class Formation or Corporate Creation?,’ Transactions of the Institute of British Geographers 35, no. 4 (2007): 490–506; Malcolm Miles, ‘Interruptions: Testing the Rhetoric of Culturally led Urban Development,’ Urban Studies 42, no. 5/6 (2005): 889–911, and Steven Miles and Ronan Paddison, ‘Introduction: The Rise and Rise of Culture-led Urban Regeneration,’ Urban Studies 42, no. 5/6 (2005): 833–839. Thrift, ‘Intensities of Feeling,’ 67–68. The zone sensible emerges from the history of a massive project of reconstruction and renovation which began in France in the 1950s. As Mustafa Dikeç points out, since the 1990s ‘Islam and the “problem of immigration”, the problem being the “integration” of non-European immigrants and their descendants into French society, became dominant themes’, articulating the banlieues as a container of bodies incongruous with the Republic’s renewed emphasis on social cohesion, laïcité and the sovereignty of the nation-state. See Mustafa Dikeç, ‘Immigrants, Banlieues, and Dangerous Things: Ideology as an Aesthetic Affair,’ Antipodes 45, no.1 (2013): 28. The 2005 riots have been much discussed elsewhere, although an exploration of the construction of corporeality and the ‘rioting body’ remains to be done. Unfortunately, due to the constraints of space, this discussion has not been as thorough as the author would envisage it unfolding. Much of the work in this field treats of the emergence of the republican body in the Eighteenth Century. See for instance, Sara E. Meizer and Kathryn Norberg, eds, From the Royal to the Republican Body: Incorporating the Political in Seventeenth- and Eighteenth-Century France (Oxford: University of California Press, 1998). Kelly Gates, Our Biometric Future: Facial Recognition Technology and the Culture of Surveillance (New York: New York University Press, 2011), 33. Indeed, when interviewed it became clear from participants that this was a self-reflexive and considered political act of dissent, carried to the level of spectacle precisely in order to draw attention to the long-standing but unspectacular issues the inhabitants faced. See Matthew Moran, ‘Opposing Exclusion: The Political Significance of the Riots in French Suburbs (2005–2007),’ Modern and Contemporary France 19, no. 3 (2011): 297–312. Guattari, The Guattari Reader, 104. Guattari, The Guattari Reader, 216. The term is taken from Sarkozy’s speeches as Minister of the Interior in 2005 at Argenteuil: ‘Vous en avez assez, hein? Vous en avez assez de cette bande de racaille? Eh bien, on va vous en débarrasser!’ Cited in Hugues, Bastien, ‘D’Argenteuil à Bobigny, les visites de Sarkozy en banlieue,’ Le Figaro, November 24, 2005, accessed July 23, 2013, http://www.lefigaro.fr/politique/2009/11/24/01002-20091124ARTFIG00435-d-argenteuil-a-bobigny-les-visites-de-sarkozy-en-banlieue-.php. 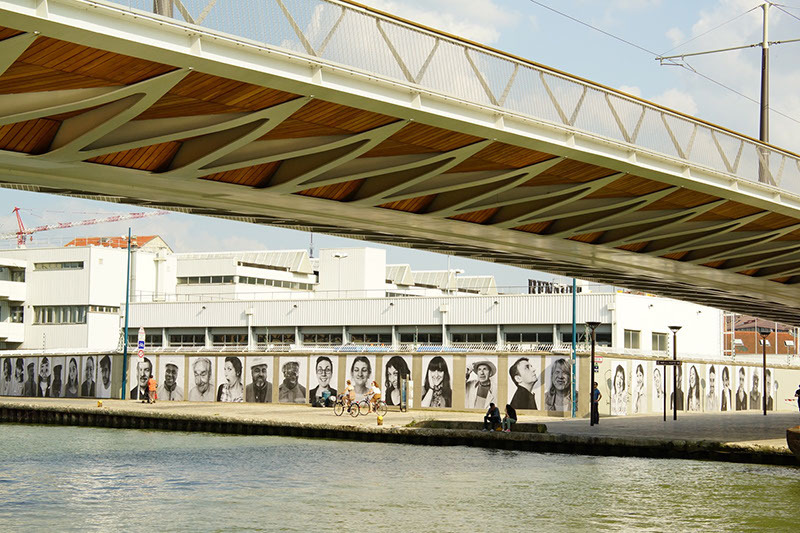 ‘Street art et graffitis, la Seine-Saint-Denis territoire d’invention et de création de l’art urbain.’ Seine-Saint-Denis Tourisme, accessed July 17, 2014, http://www.tourisme93.com/street-art-graffitis-93.html. Marguerite Duras, Hiroshima, Mon Amour (Paris: Gallimard, 1972), 33–34. Guattari, The Guattari Reader, 199. Dikeç, Badlands of the Republic. Steven Shaviro, ‘Pulses of Emotion. Whitehead’s ‘Critique of Pure Feeling,’ The Pinocchio Theory, last modified 2007, accessed May 5, 2013, http://www.shaviro.com/Othertexts/Pulse.pdf: 8. Roger Epstein points out that the rehousing policies enacted by the Borloo law do not lead to the social mixity desired, but rather accelerate the departure of people that provide community structure without dispersing poorer households amist a more economically stable class. Roger Epstein, ‘Rénovation urbaine: Succès politique d’une politique en échec,’ L’Observatoir Régional de l’Intégration et de la Ville (June 7, 2012): 5, accessed November 10, 2013, http://www.oriv-alsace.org/pages1/6-poli/thematiques/rencontre_oriv_synthese_intervention_r_epstein_juin_2012.pdf. Thus, the consensus that in Mainte-la-Jolie, ‘le plus gros chantier de l’histoire civile française’ would ‘redonner un visage au quartier,’ at the same time as it would ‘redonner un sentiment de dignité aux Mantois.’ Claudie Baran, ‘Rénovation urbaine: quels résultats?’ Le Figaro, April 4, 2012, accessed April 20, 2014, http://www.lefigaro.fr/immobilier/2012/03/23/05002-20120323ARTFIG00708-renovation-urbaine-quels-resultats.php. Claudie Baran, ‘‘Je veux qu’on aille plus loin’,’ Le Figaro, April 18, 2012, accessed July 15, 2014, http://www.lefigaro.fr/lefigaromagazine/2012/03/23/01006-20120323ARTFIG00720-je-veux-qu-on-aille-plus-loin.php. Quatre Chemins and Les Courtillières. Both areas are part of the ville de Pantin’s ‘plan local d’urbanisme’ and undergoing renewal at the time of writing. Edkins, Face Politics, 42. I draw here on Edkins’s pertinent evocation of Jacques Derrida’s notion of ‘hauntologie’. See Jacques Derrida, Spectres de Marx: L’Etat de la dette, le travail du deuil et la nouvelle Internationale (Paris: Galilée, 2006). Gregory J. Seigworth and Melissa Gregg, ‘An Inventory of Shimmers,’ in The Affect Theory Reader, ed. Gregory J. Seigworth and Melissa Gregg (Durham, NC: Duke University Press, 2011), 11. See Rosalyn Deutsche, Evictions: Art and Spatial Politics (London and Cambridge, Mass: The MIT Press, 1996) and Henri Lefebvre, Le Droit à la ville (Paris: Anthropos, 1968). 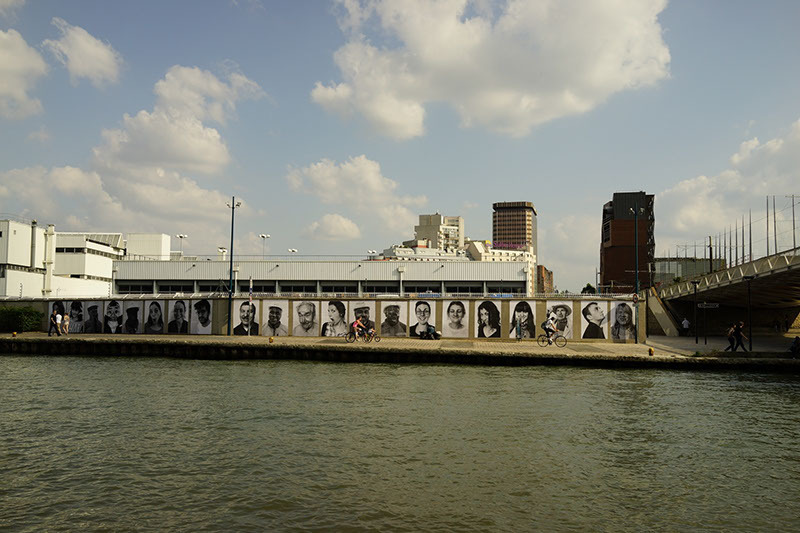 As part of JR’s global participatory art project, Inside Out’, organizers of exhibitions (including those involved in ‘L’Ourcq Mon Amour’) sent the digital files of their photographs to JR’s team in New York, where the files were printed in poster format and sent back to the participants. ‘300 photos noir et blanc exposées le long du canal de l’Ourcq,’ L’Express, July 9, 2013, accessed October 12, 2013, http://www.lexpress.fr/actualites/1/culture/300-photos-noir-et-blanc-exposees-le-long-du-canal-de-l-ourcq_1265100.html. Jakob von Uexküll quoted in Giorgio Agamben, The Open. Man and Animal (Stanford, CA: Stanford University Press, 2004), 51. Félix Guattari, Chaosophy (New York: Semiotext(e), 1995), 25. Bertelsen and Murphie, ‘An Ethics of Everyday Infinities and Powers,’ 157.